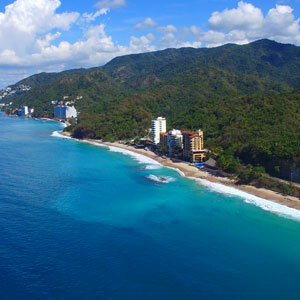 If you want a romantic holiday, Puerto Vallarta is the ideal stage to play out your love story. You will be able to discover new places with your partner and rest assured you will love eating out in the picturesque restaurants in the “Zona Romántica” or near the River Cuale. You can also go for a walk along the Art Walk, visiting the city’s art galleries, going for a spot of shopping, enjoying the urban artists shows which are on all along the Malecón, or take in the prehispanic show of the famous ritual, the “Voladores de Papantla” (The dance of the flyers). Puerto Vallarta will be the ideal stage to play out your love story. Love blooms when the sun goes down. There is nothing more romantic than walking hand in hand with the person you love with the backdrop of a stunning sunset in Puerto Vallarta, whether it is from the Malecón, our viewpoints or on the seashore and walking along the sand. 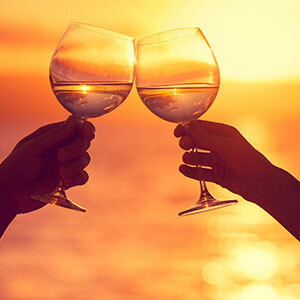 Come to Puerto Vallarta and discover your own personal sunset with that special person. Get ready to live unforgettable experiences in the most iconic places, the colorful streets and calm beaches. 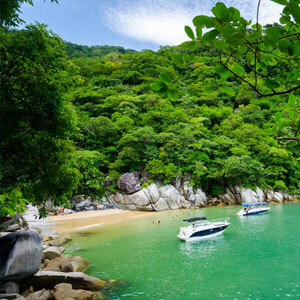 Explore the Puerto Vallarta beaches with your partner. Whether it be relaxing or going on an adventure together, there are special tours that cater to everyone’s taste. You can enjoy a moment only for yourself and your partner by the sea, take a tour and live the adventure in Los Arcos Marine Park or Quimixto, or even practice some aquatic sports together. In Puerto Vallarta you will find different restaurants, bars, hotels, and gardens where you can celebrate your love and, if you want to take the next step, even get married with the person you love. Nothing like saying "I do" by the sea, or releasing baby turtles in the beach… There are so many plans! Come and live your love story.